Looking for a way to prepare for the 16PF test? Prepare with JobTestPrep's online preparation package, which includes practice tests, answer explanations, and score reports. Additionally, it includes 72 16PF–style questions. Start preparing today to ensure your success. The 16 Personality Factor Questionnaire (16PF) is a personality test that was developed over several decades by Dr. Raymond Cattell. He postulated that an individual's personality can be summarised into 16 personality factors. The theory behind this test also corresponds to the Big Five Model. The 16PF is used for various kinds of testing, including pre-employment and promotion testing. As a start, you can get ready with the Free Personality Test Sample. Ready to study for the 16PF? JobTestPrep provides you with quality 16PF preparation. We offer a range of pre-employment personality test solutions, helping to ensure you are prepared and confident on test day. The 16 Personality Factor Questionnaire asks about specific, everyday situations in order to assess your daily behaviour, interests, and opinions. 16PF test questions identify and evaluate your abilities for future employers. My thoughtfulness and charitable nature are my foundation. I like to solve complex problems. I continue until everything is perfect. 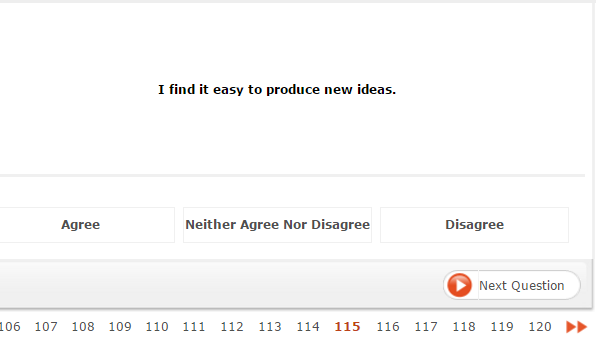 I am not especially interested in abstract ideas. Each item on the 16PF test has three options, and each answer choice is scored differently. The approval answer choice (True/Agree) is ranked as a 3, the question mark answer choice (?/Neither Agree Nor Disagree) is ranked as a 2, and the anti-approval answer choice (False/Disagree) is ranked as a 1. After completing the 16PF, your answers will be scored and summarised in a report. The score report outlines your personality-based strengths and weaknesses. The traits measured include learning methods and problem-solving skills, stress coping, interpersonal and work styles, and overall professional effectiveness. The information contained in the report states what you believe and value most about your life, as well as what you want it to include in the future. Your results also depict the general career areas that will most likely appeal to you based on your personality. There are seven career areas included in the report: Influencing, Organising, Helping, Creating, Analysing, Producing, and Adventuring. These areas are listed in a chart comparing your personality to the profession that is best suited for it. In addition, you are provided with a description of each career orientation area. See an example of a 16PF score report below. Below is a sample question from our personality practice test. It is styled like the actual 16PF test. Becoming familiar with the types of questions found on the exam will help you when you take the actual 16PF. As a job candidate, your 16PF test results are scored using the 16 Personality Factors, sometimes called the 16 Primary Personality Factors. These factors are used to determine whether or not your personality matches the job description. Your 16PF test results are scored according to the job for which you are applying. Among the most important personality traits for potential employers are problem-solving, conflict management, communication, team-building, decision-making, and leadership. JobTestPrep offers you a personal, customised report of your personality test based on the specific job you want. There are multiple reports available for the 16PF for a variety of careers. Each report analyses specific traits for different professional contexts. Some of the available 16PF reports are the Career Development Report, the Teamwork Development Report, the Management Potential Report, and the Psychological Evaluation Report.